Folds to fit into a trunk. Set up size is 24" wide x 48" long x 48" tall. 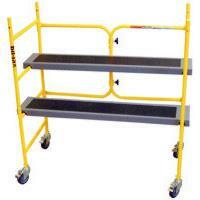 2 steel planks can be placed at 10", 22", 34", or 46" height. * Please call us with any questions about our scaffold 4 foot handy roll w/ wheels rentals in Oak Grove MO, Blue Springs MO, Independence MO, Lexington MO, Odessa MO, Independence MO and Western Missouri.